Northwest auto shop turns to floor tape to help improve safety and boost productivity. When you are working with dangerous equipment and heavy machinery, safety is always a concern. Add in customers and the fact that you’re an ongoing training facility and you have yourself a recipe for potential injuries, or worse. The auto repair shop at Portland Community College (PCC), located in the great Northwest, is a prime example of how education and a working shop can coincide, as long as safety is the number one priority. The shop works as a fully functioning repair shop for customers in the Portland area, but also functions as an educational center for students to earn a degree in auto repair. Recently, the shop was awarded funds to install new floors, but they wanted more than just shiny new floors. They wanted a way to increase safety and improve efficiency on all levels, throughout the shop. Entrance to PCC auto shop with clearly marked indicators using floor tape. The PCC shop is large in comparison to the average shop. They have a lot of foot traffic coming and going each day. For those who have never been, it can be confusing to navigate if you don’t have indicators to direct you. For those in the industry, you know how dangerous it can be to have customers wondering around a shop full of heavy machinery and expensive equipment. 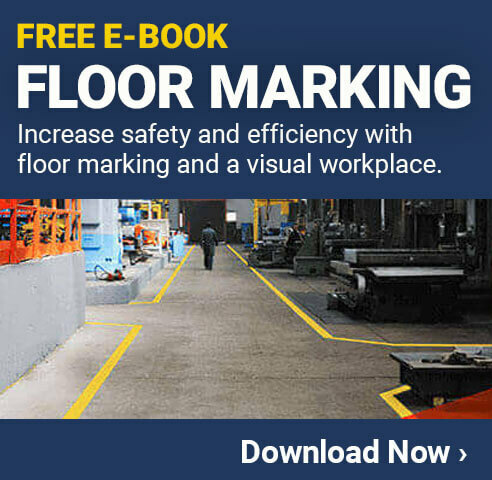 The need for clearly marked floors was a major priority for the shop which is why they reached out to a local visual safety expert for advice. Creative Safety Supply is a global leader in visual safety products and was more than happy to help out a local college in their efforts to create a safe and efficient working/learning environment. The company produces some of the highest industrial rated floor tape on the market, including SafetyTac Floor Tape, which ended up being the perfect solution for PCC’s vision. The floor tape was installed throughout the facility to mark of walkways, hazard areas, equipment locations and much more! With a blank slate to work from (brand new floors), the staff at PCC and Creative Safety Supply were able to sit down and envision the safest area possible for the students, staff and customers that come in and out everyday. Clearly marked visuals are and have been the best way to create a universal language for anyone that may happen to come into your facility. Helps promote the employee’s commitment to the organization’s culture, mission and values. Is a mechanism for consistent communication and information throughout your facility. Guests feel more welcome, informed, and feel like they will be received in a proficient manner. Instantly improves look and feel of the facility. Wait Time: Floor tape requires no dry time before being able to walk or drive over it. Durability: Floor tape is easy to clean, maintaining appearance and durability over long periods of time, even with heavy traffic.